Burgers are nothing if not classic. No one knows that better than Don Yovicsin, one of three finalists in the 2016 Boston Battle of the Burger Home Grillers competition. His hack of the Big Mac, the McDonald’s quick-serve classic, brings the flavor of high-quality homemade ingredients to the McDonald’s favorite. 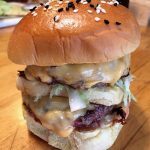 Don’s Big Hac is not only a tasty Burger, but also a clever re-imagining of an old favorite that might make you rethink how you Burger at home. The storied McDonald’s BIG MAC is America’s biggest selling burger “evah* ”! It is ingrained in America’s collective mind by virtue of the snappy advertising jingle “two all-beef patties…” and in America’s heart while severely clogging it and beefing up the waist line of Main Street to Wall Street. I will deconstruct every element of this carne classic and amp up each element to make my BIG HAC gourmand worthy! 1. Grill Burgers on screaming hot plancha using the smash method. Add cheese and bring to melt. 2. Construct Burger by layering onions, lettuce, one Burger patty, and special sauce on bottom bun. 4. Add remaining Burger patty, onions, lettuce, and special sauce on top of middle bun. 5. Add pickle chips and top with top of bun. 6. Create special presentation & packaging for extreme WOW factor. A very proud Bostonian with an unusually twisted fascination with BBQ & burgers. When he is not stoking a grill or pit he is passionately rooting for his “City of Champions” Boston sports teams or fishing with his son throughout Cape Cod. A two time Battle of the Burger home griller champion that wants to go out a 3 time winner with the retiring David “Big Papi” Ortiz! 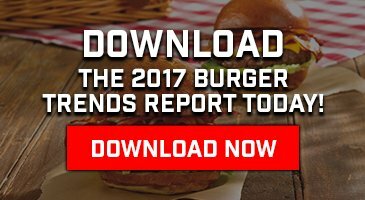 Of all the Burger-lovers who submitted their recipes for The Very Best Burger, three finalists were selected to grill their Burgers for a panel of judges at Boston Magazine’s Battle of the Burger. The winner will not only take home bragging rights, but a prize package including $200 in Schweid & Sons Burgers, a Schweid & Sons apron, and a grill from Kenyon Grills.